If you own a construction company, you must have realized the importance of having a website. With infinite construction websites WordPress templates available in the market, you have endless themes to pick for your business. Whether you own a small sub-contractor business or an enormous construction business, these WordPress themes are the ideal options for you. With their pre-build layouts, you can comfortably build a website for your construction business. You can showcase your projects, display amazing testimonials received from clients, show your services, introduce your team, add contact forms and more through your website. Most importantly, you will build trust with your present and possible future clientele. 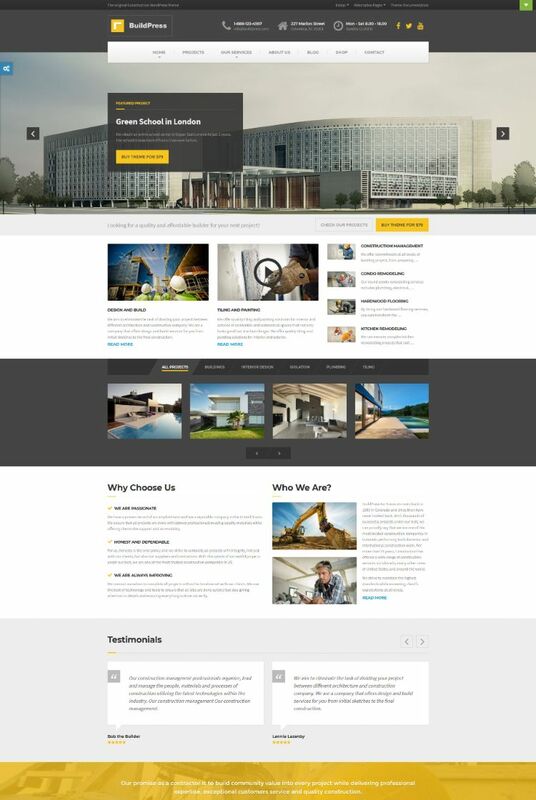 Each of the templates below is suitable for creating professional construction business websites. So whichever theme you choose, you shouldn’t have trouble to build a website to promote your business. That being said, here are 25 best construction company WordPress themes of 2019. Multiple Call-to-action sections for lead generation such as Get A Quote, multiple contact forms and buttons to lead to the contact page. 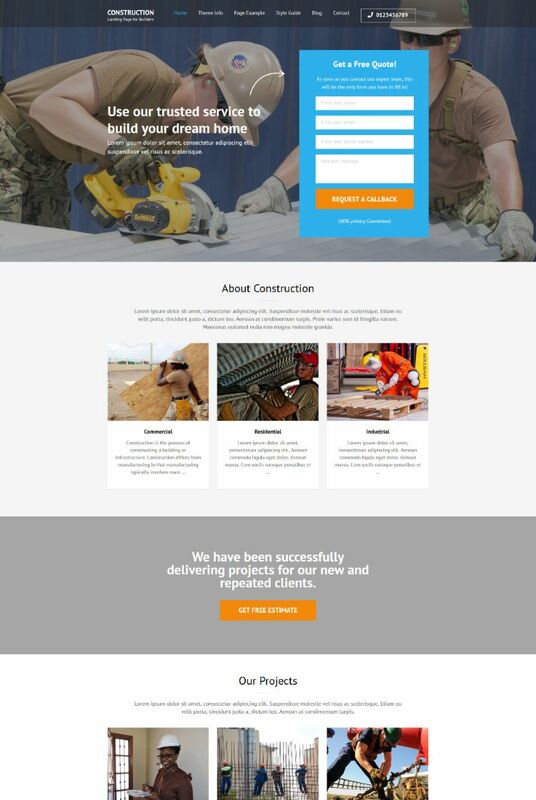 If you are looking to create a lead generating construction company website, you should use Construction Landing Page Pro theme. This theme was built with one main purpose i.e. to make the website sales generating machine. Construction Landing Page Pro includes a prominent contact form in the above the fold area, which gets the attention of the website visitors. Built using conversion optimization techniques, this form is bound to generate sales enquiries. There are 3 more call to actions sections. Firstly, it includes Get A Quote in the navigation, which flows with the stick menu. Secondly, a banner section with a distinguishable button asking to contact you. Lastly, another well thought contact form in the banner section. 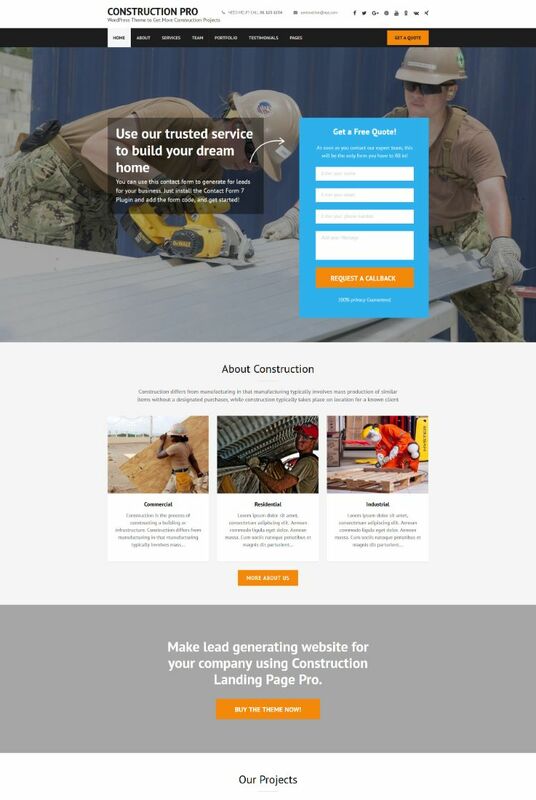 Thousands of construction companies who search for a lead generating, highly functional and attractive theme stop right at Construction Landing Pro. This theme combines a wide customization option with exciting features to build a top-notch website for builders, contractors, engineering companies. The theme has a section below the banner where you can talk about your company and the major service that your company provides. With the use of parallax effects, visitors find your website enjoyable to surf and tend to spend more time surfing the nook and corners of your site. How great it is to engage the visitors on your website who might turn into your clients! Show your latest or the most significant projects to your visitors and let them witness your building and construction projects of the highest quality. And to attract a wide range of customers, show all the services you offer in the Service Section. Moreover, you can show the significant brands that you have worked with and your partners with their logos in the accreditation section. Right below it in the Testimonial section, showcase the good words of your clients with their name and image. The exciting features do not end here. The Price & Packages section on the homepage helps you tell the prices of most common projects without answering a phone call or replying a mail. This helps you save your time as well. You can introduce your team members to your visitors with pride. Display their images and add a few qualities of them so that your clients can know them better. Besides all these features, there are also statistics counter, a section to show your service area, and tons of social media integration. When your visitors come all the way down to the bottom of your site’s homepage, an attractive Call To Action enquiry form awaits them to contact you. On top of these amazing features, the theme is compatible with WPML and Polylang to create a multilingual website, SEO-friendly to outrank the competitors, mobile-friendly to display nicely in devices of different screen sizes and GDPR (General Data Protection Regulation) compliant. Construction Landing Page Pro also supports some major plugins like Contact Form 7, Jetpack, and Regenerate Thumbnails. 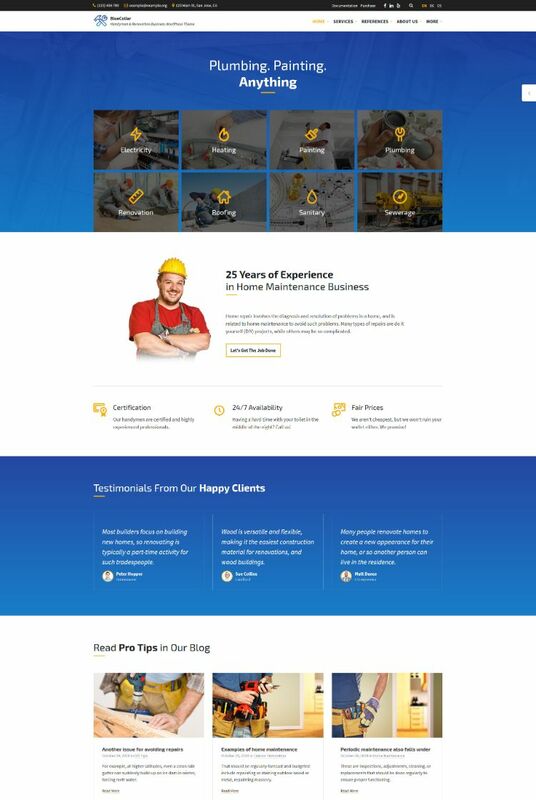 Construction Landing Page is lite and free version of Construction Landing Page Pro and it is one of the top free WordPress themes for construction businesses. It is a great choice for builders, interior designers, general contractors, plumbers, landscapers, and any other businesses related to construction. Built with the lead-generating approach, the theme has an over-the-fold contact form right on the banner. 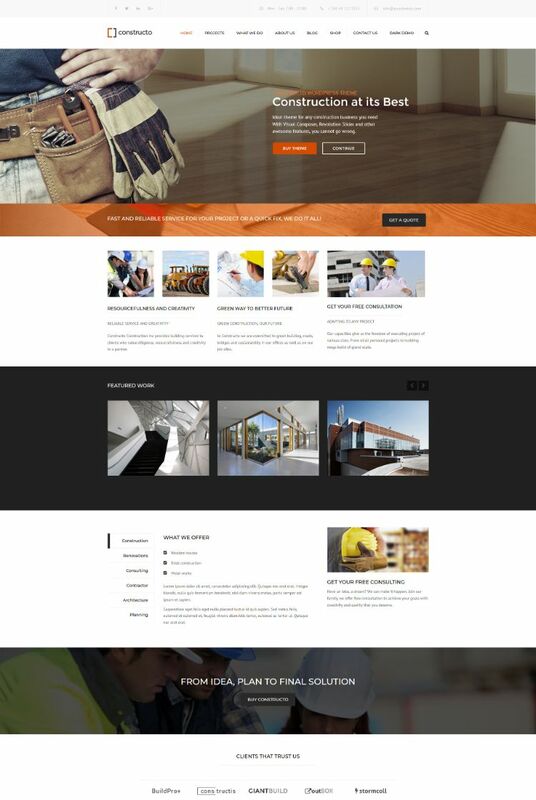 So building and construction companies with a quality service can easily generate leads for their services with this free theme. Below the image banner on the homepage, you can show the details about your company. Share your recently-completed projects and the details about your services in the middle part of your home. The bottom part of the homepage of this theme has a huge contact form to entice your visitors to ask for the quotation. The parallax scrolling feature of the theme makes it quite entertaining to surf your website. Features like the clean and beautiful design, built-in live customizer, WooCommerce compatibility, multiple widgets, and translation readiness makes this theme as good as many premium themes. Construction Landing Page has a video tutorial which makes it easy to follow and set up your website. 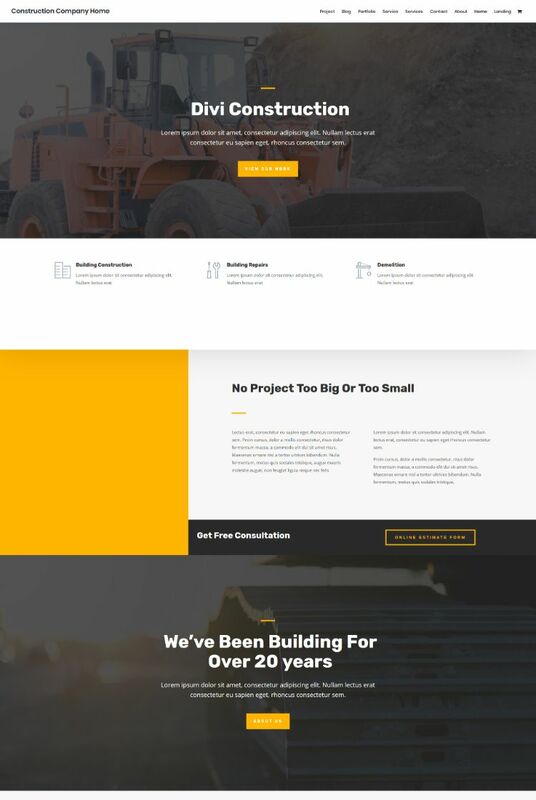 Divi, one of the most popular theme, has a construction layout that you can use to promote your construction company online. 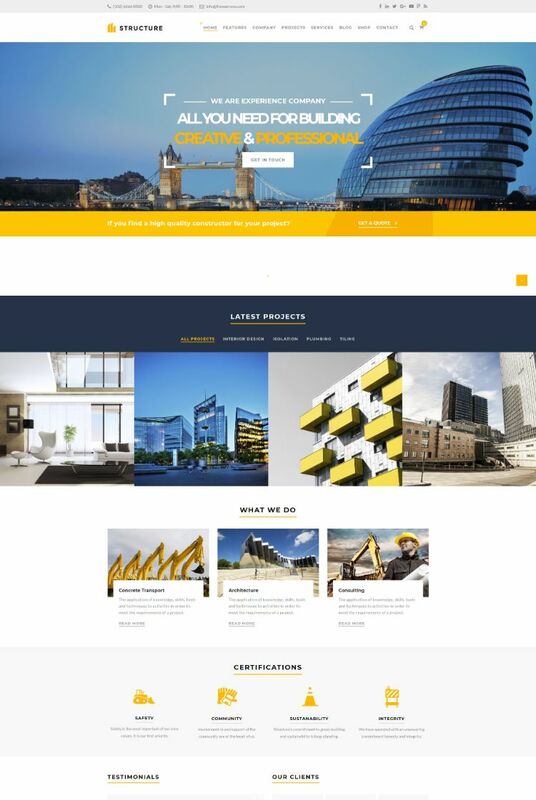 With this theme, you can build a powerful website of your building and construction business which will put you a step ahead of your competitors. When a visitor enters your website, the homepage has a huge image banner section that visitors get on their screen. You can briefly describe your services below the banner section. 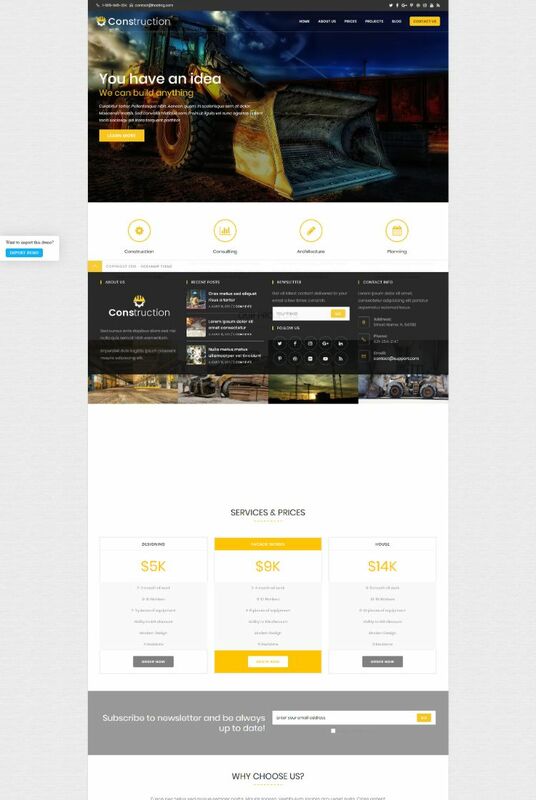 Also, you can show the admirable features of your construction company on the homepage. There is also a testimonial section where you can show the comments of your happy clients. Besides a complete and powerful homepage, the template also has a services page, project page, and a portfolio page. If you want to make some change on the pre-built construction layout, you can design custom layouts with the drag-and-drop tool – Divi Builder. You can also add extra and advanced features to your site without the use of any additional plugin. WP Astra is one of the most popular multi-purpose WordPress themes that you can use for your construction business as well. 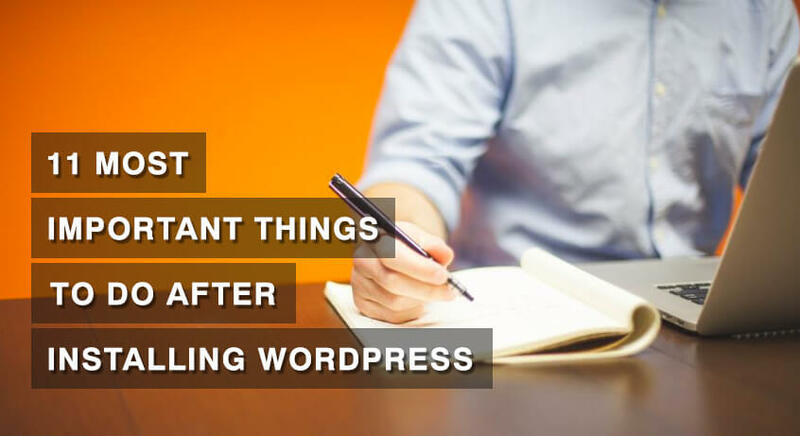 With WP Astra, you get access to some very powerful features without having to design or code. 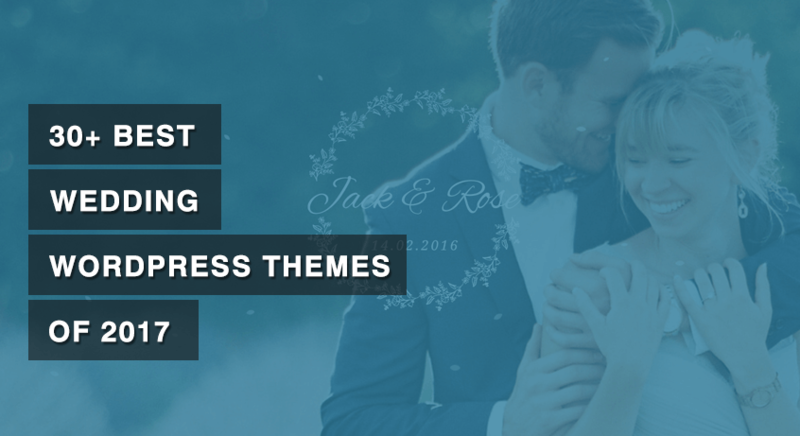 The theme provides you flexibility with four layouts to choose from. Likewise, you can choose your blog layout from the list, grid, and masonry layout. It has multiple header designs, 800+ fonts option, unlimited color option, flexible footer, and more. As the theme is WooCommerce integrated, you can build an e-commerce store with a high conversion rate. With Astra Pro, you can welcome your visitor with a nice banner section. You can provide the information about your company and list your service on the homepage. Moreover, you can show the projects that your firm has completed. Likewise, show the good words of your clients in the testimonial section. If you like to introduce your team members to your visitors, you can do so through a team section on the homepage. You can also display your total completed projects, and the awards you own, the total number of clients, and more through statistic counter. Moreover, you can provide information about your company with other pages of services, blog, projects, and more. 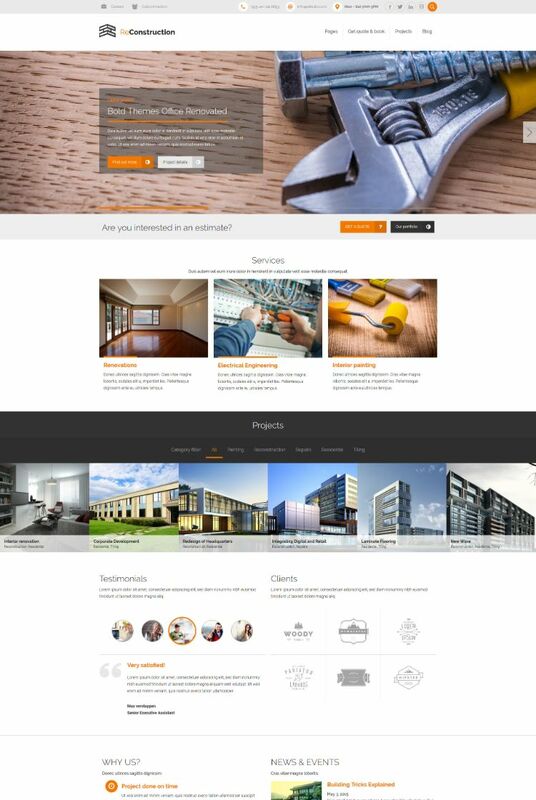 Overall, WP Astra is a great theme that can be the ideal option to build your construction business website. Construction is a demo of the multipurpose OceanWP theme that has many exciting features. 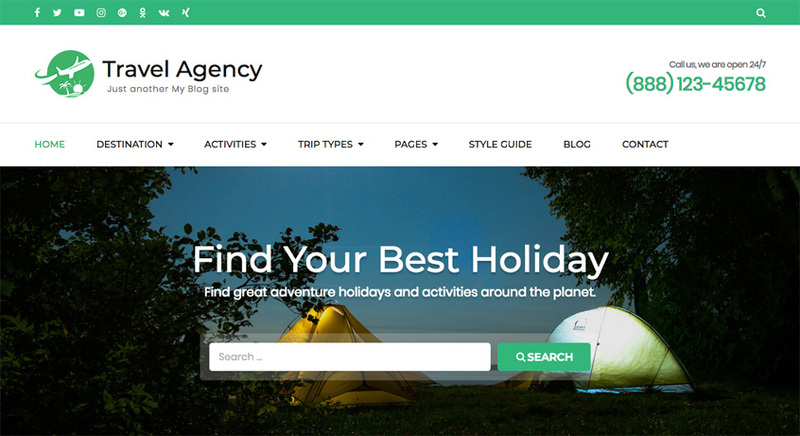 Being a fully responsive theme, this theme looks great on devices of all sizes. With its quick page loading speed, you can build an extensively fast website. The theme is translation ready which lets you translate your contents in other languages as well. In the homepage of Construction demo, there is a beautiful image banner section. The sticky menu on the top lets your visitors surf your site easily without having to return back to top for taking actions. Right below the banner, you can display the information about the services that your construction firm offers and your major projects. To let your visitors know about the prices of your services, there is a section on the homepage where you can give brief information about your services and price rates. To convince your visitors to use your service, there is a section on the homepage to show the qualities of your business. Moreover, the testimonial section will let you display the praise words of your previous clients. The theme has built a newsletter section too that helps you get subscribers. You can build a set of long-term and committed clients with this. 907 is a multipurpose WordPress theme that has satisfied many construction-related businesses. It has more than 23 demos, with one demo focused on building websites of builders, contractors, and construction businesses. As someone enters your site, a nice video banner welcomes your visitors. Right underneath the banner, you can showcase your major services. Below them, you can show your recently built or favorite projects to allure your visitors. A beautifully-built statistics counter allows your visitors to know the number of projects done by your company, the number of your awards received, and the number of your team numbers. You can also display all your primary and secondary services. If you would like to introduce your team, you can do it in the team section of your homepage. There is also a testimonial section where you can display the praises of your clients or partners. To keep your visitors up to date with new affairs, you can display your latest post on your homepage. Likewise, the bottom part of your homepage allows your visitors and clients to contact you easily. 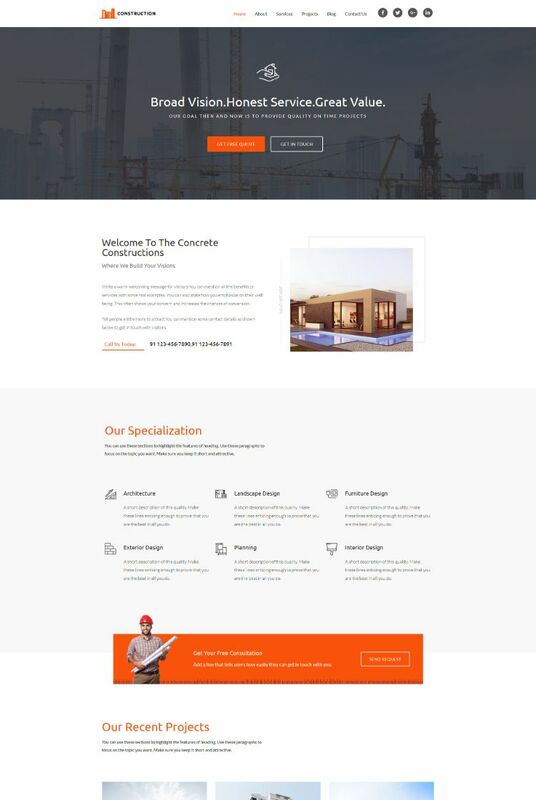 Construction is an attractive business WordPress theme built for construction and building companies. It has a clean design and is easily customizable. Pre-packed with so many exciting features, this theme uses Visual Composer page builder to create web pages easily and quickly. It also includes Free Slider Revolution and Free Essential Grid plugins. This fully-responsive theme has both full width and boxed layouts. With its advanced theme options, you can reshape things around and give your website a unique and better look. For a quick process, it has one-click demo import and one-click theme update. Furthermore, the WPML compatibility of the theme allows you to build your website in multiple languages. The theme has a slider banner image section where you can put a quotation button or direct your visitors to your other significant pages. Below the slider, you can display brief information about your company. To show the world what your construction company can offer, present the best projects right below the service section. The homepage also has a service section where you can show all kinds of services that your business offers. Right above the footer, you can unveil your clients and also show the reviews of your clients. You can also keep your visitors updated with the latest news and events about construction and building businesses. For easy installation, this theme comes with demo data files and documentation. Furthermore, its amazing support team offers you quick and generous support. Creator World is a multi-purpose WordPress theme that has a clean and minimalistic design. It has a white background which looks beautiful. 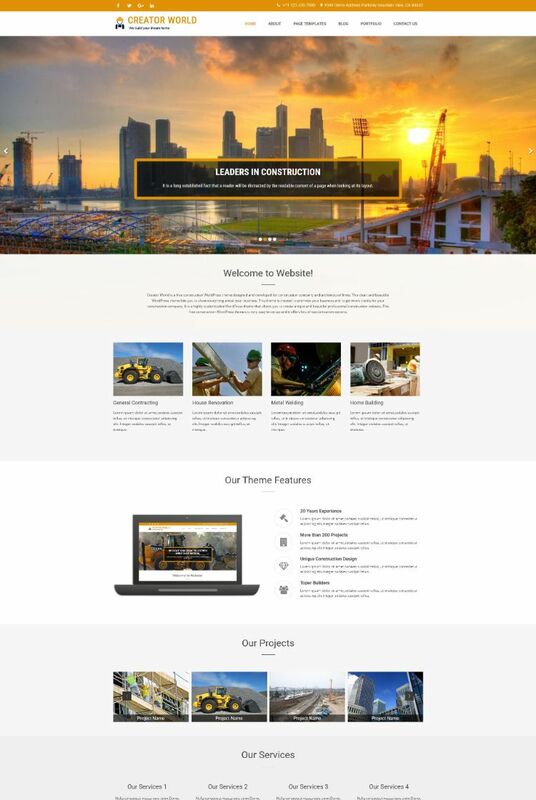 You can use this theme to create websites of construction companies, architectural firms, and small contractors business. 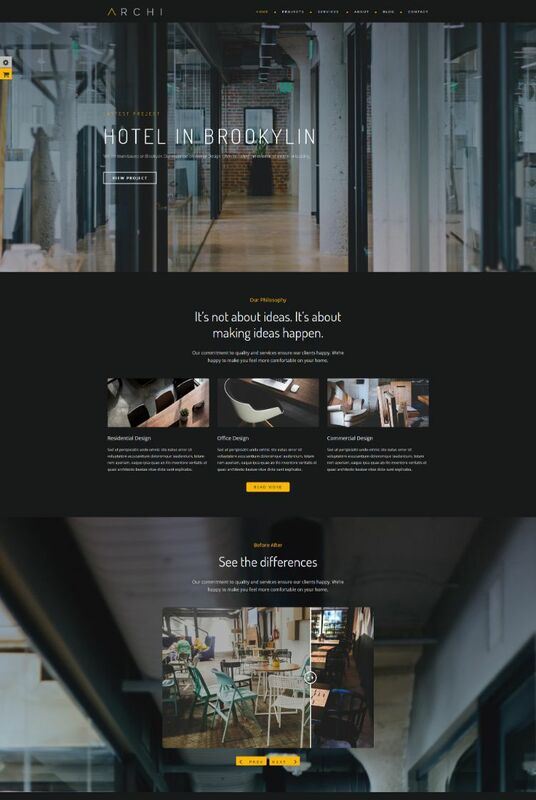 You can also use this theme to build websites of other kinds of businesses of photography, restaurant, hotels, and more. Creator World has in-built customizer which lets you make changes on your site easily. The theme is retina ready and fully responsive. The page loading speed of theme is pretty fast so your visitors can navigate to different pages of your site quickly. The theme is translation ready as well. The theme has a lovely homepage layout. You can choose the color and text fonts of your site. The homepage has attractive sections where you can give a detail information about your company, services, and the team members. The theme also has a portfolio page where you can show your great works and projects. Likewise, with the help of the blog page, you can keep your visitors engaged with some great contents. 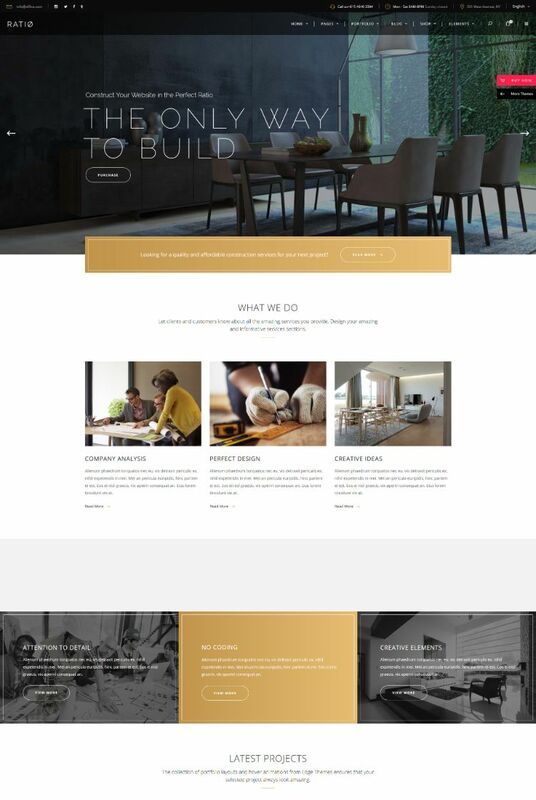 All in all, Creator World is a great theme with a simple, clean, and effective design to make your construction company website. With the drag and drop interface of an integrated Page Builder, you can build pages quickly and comfortably. Built for multiple purposes, BuildPress is a great theme to create any kind of construction-related business websites. 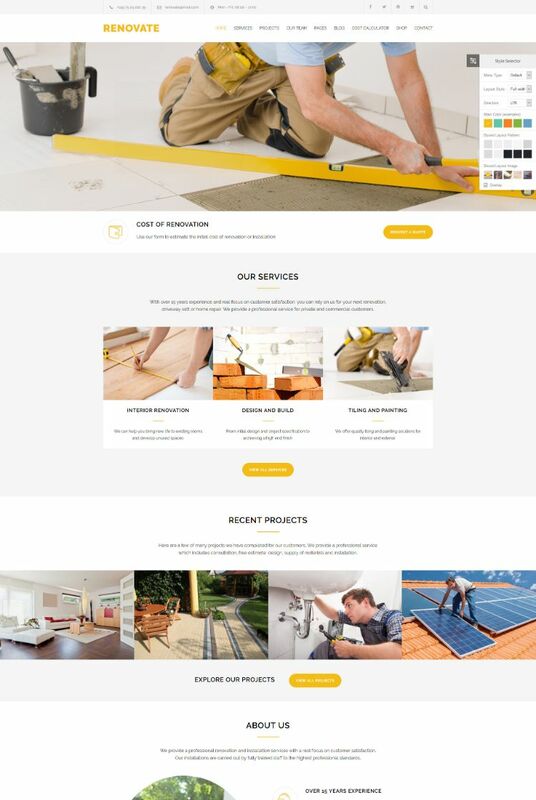 With this theme, you can create websites of businesses and services like landscaping, plumbing, handymen service, subcontracting, and so forth. 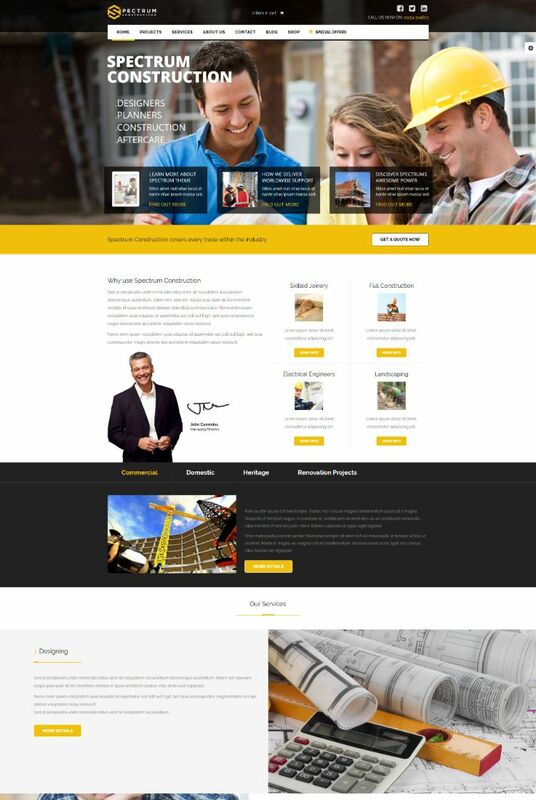 Thousands of construction companies and builders have loved this template. 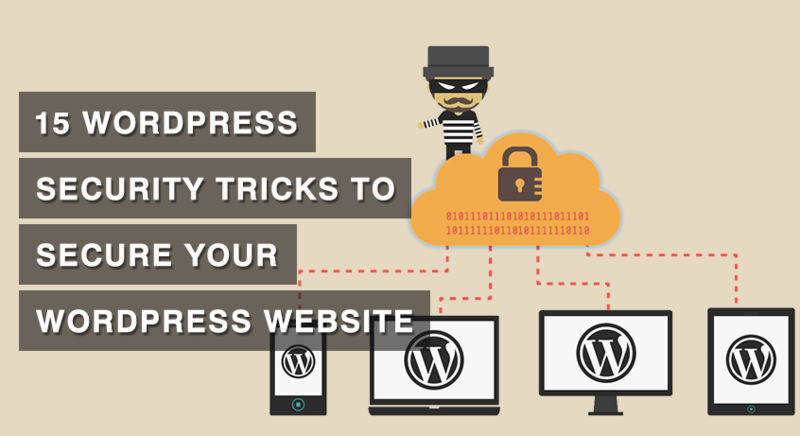 BuildPress is simple to set up and you do not need any coding knowledge to make your website ready. With its intuitive page builder, you can build your pages with ease. The real-time WP Customizer allows you to preview every change that you make in your website. To create a unique layout, this theme offers you several custom sidebars and widgets. The premium Essential Grid plugins that come free with this theme lets you display your business’s portfolio in attractive grid formats. Furthermore, WooCommerce compatibility of the theme lets you build your online store and sell your products online. BuildPress also supports some major plugins like Contact Form 7, Jetpack, and FancyBox. Constructo – built specially for construction companies, allows you to choose from 11 demos to build your business website. With one click installation, you can test and trial the different demos and pick the one that you think fits best for your construction business. Many contractors, plumbers, electricians, landscape businesses, builders, and general contractors have built their websites with Constructo. The theme has a new vertical menu that gives your website a unique look. 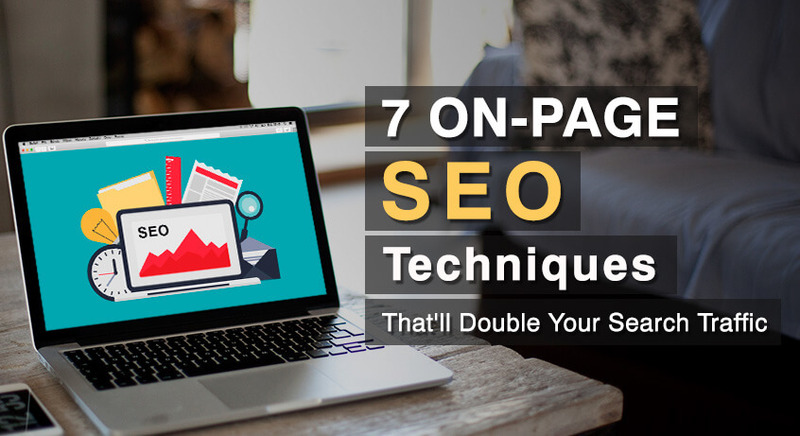 With the availability of both the wide and boxed version, you have more flexibility with your website. Likewise, the theme also includes page options that let you control and edit your pages individually. Likewise, the WPML compatibility of the theme lets you create your website in multiple languages. If you have construction-related products to sell, the WooCommerce compatibility of Constructo can be the added benefit. Renovate WordPress theme has helped thousands of builders, contractors, and remodeling companies. 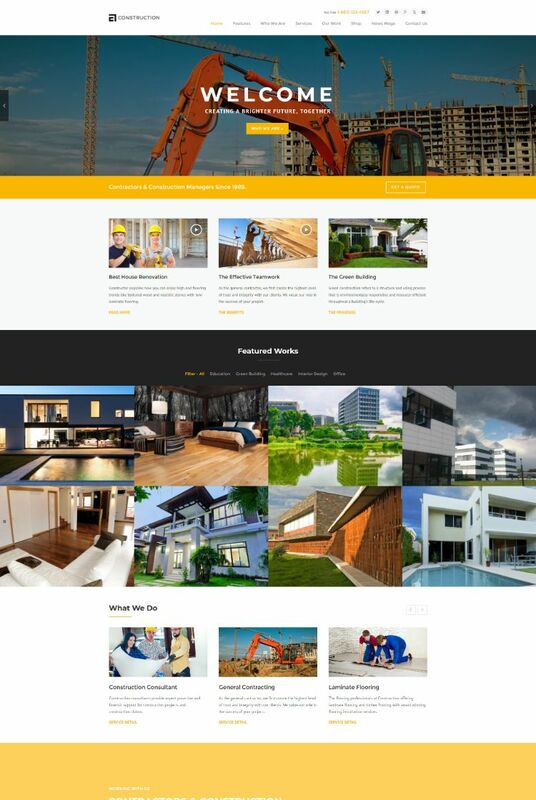 With all the elements that a construction business needs such as portfolio showcase, services, team, and contact details, this theme is ideal for promoting your construction business. The responsive layout of the theme makes it easy for your visitors to surf your website from any device. As mentioned above, its significant features include the compatibility with Slider Revolution, Cost Calculator, and WooCommerce. 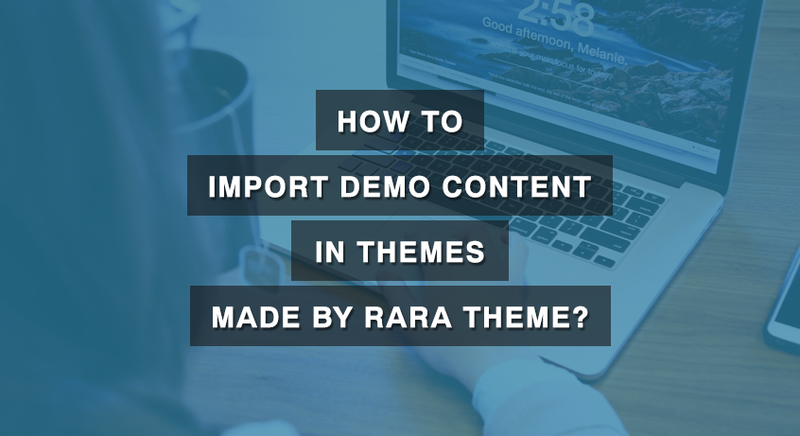 Its powerful theme options panel allows you to easily import the demo content and customize your website. You can customize colors, logo, menu, fonts, and so much more with the options panel. Renovate supports isotope gallery, parallax backgrounds, and unlimited menus and sidebars. Likewise, its smart sticky column lets you show your column effectively while your visitors surf long pages of your site. Specially built for design and construction companies, Archi is a WordPress theme with many exciting features. It is among the best selling WordPress themes for interior designing themes. Archi uses drag-and-drop page builder with more than 30 custom elements to build a site. It also includes the Slider Revolution which allows you to create infinite sliders without coding. With the clean design, you can create a pixel-perfect website. This fully responsive theme looks great on all devices. So, regardless of what device your visitors surf your site through, every section of your website looks great and stays responsive. When it comes to customizing, the theme offers you easy customization options. From changing the entire layout of your theme to making some small color changes, you can easily remold your site. A beautiful slider banner welcomes visitors. Right below the banner, you can display the major services of your company. The Before-After section on the homepage lets you show photos of your best projects. The masonry designed gallery below the statistics counter allows you to share the images of your completed projects effectively. The bottom part of the stunning homepage allows you to display the procedures you use while dealing with your clients. So, your clients can have a clear idea of how the process works. An attractive quotation button in the homepage allures your visitor to contact you through email. Elegant, functional, and inexpensive, Construction WordPress theme is the ideal option for building construction websites. This blazing fast theme has an attractive design with the most useful sections put in an organized way. The sticky and transparent menu with a banner slider image welcomes visitors in your website. Place your quotation button and contact-us button on the top to get more leads. With the display of major services and the information about your company, you can familiarize your visitors with your construction business instantly. The attractive portfolio with different categories looks quite unique and attractive. Underneath the portfolio section, you can show the companies that you have partnered with in your business. The large testimonial section on the homepage allows you to share the good words of your clients. Right above the footer of the homepage, you can share the latest news and happenings of your construction projects with your visitors. You can offer service brochure downloading option too. Spectrum is a specifically built WordPress theme for the construction industry. With the easy one-click installations, this theme offers several demos for construction companies, electricians, landscape service providers, flooring companies, interior designers, roofers, plumbers, and any construction-associated businesses. The video tutorials, theme documentation, and quick support of Spectrum make it easy to build a construction company website. Spectrum uses the Slider Revolution plugin that lets you customize your slider as you wish. Likewise, it includes Visual Composer Plugin with which you can build your web pages through the drag-and-drop interface. On its homepage, you can use parallax image video background to grab your visitor’s attention. Likewise, the moveable and unlimited sidebar options allow you to give your website the appearance that you like. Spectrum has ample space for service section where you can show images and describe your services. And place your quotation buttons strategically to get more leads from your visitors. You can show your latest or the best projects on your homepage to allure your visitors to use your service. If you have any accreditations to display, you can show those too. Furthermore, the Company News section on the homepage lets you post your latest events or plans to show your visitors. With a chic design, Ratio is a premium WordPress theme that works great for building architecture, construction, and interior designing company websites. Packed with 15 stylish homepages, 25 portfolio variations, and 10 project types, this theme offers tons of options to create a unique design. A wide slider on the homepage looks quite attractive. Right below the slider, you can give brief information about your company and what your company does. You can also display the number of projects that you completed, the number of projects you are completing, the total number of your team members, and more in the statistics counter. you have nice images of your previous projects, you can showcase their images in an attractive way on the homepage. Likewise, provide detail information about your office, team members, and the good words of your clients on the homepage. There is also a section on the homepage where you can display the latest news that is related to construction businesses. Furthermore, the accreditation section above the footer lets you display the brands that you feel happy to work with. Ratio is compatible with WooCommerce plugin which provides you an option to build your own online shop to sell your construction products. 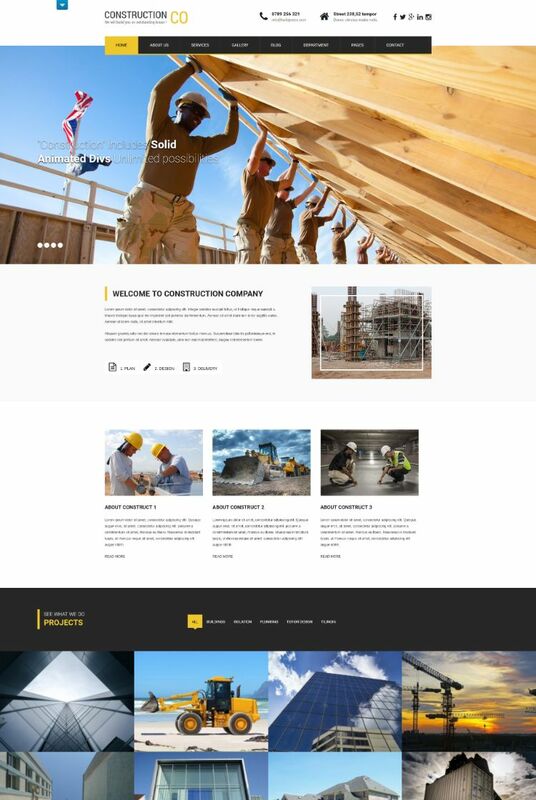 Structure is a responsive WordPress theme that can be used to make building companies, construction, and engineering websites. With its professional design, the theme shows the professionality of your business and help you gain more clients. With the Visual Composer Builder, you can easily build your website with drag and drop interface. The theme also includes major plugins like Contact Form 7, MailChimp, Templatera, and more. Since the theme supports WooCommerce plugin, you can build an online store in your site and sell your products. With the free Slider Revolution Slider Plugin, you can adjust the slides and slider of your website. Right below the slider banner on the homepage, you can include a quotation section to convert more leads. To convince your visitors to use your service, there is a section on the homepage where you can show your latest projects. You can categorize those projects into different types as well. Some other significant features include sections to display certifications, services, and good words of your clients. Besides, you can also show the number of projects you have completed, the number of team members, and the prestigious awards that your construction company has won. 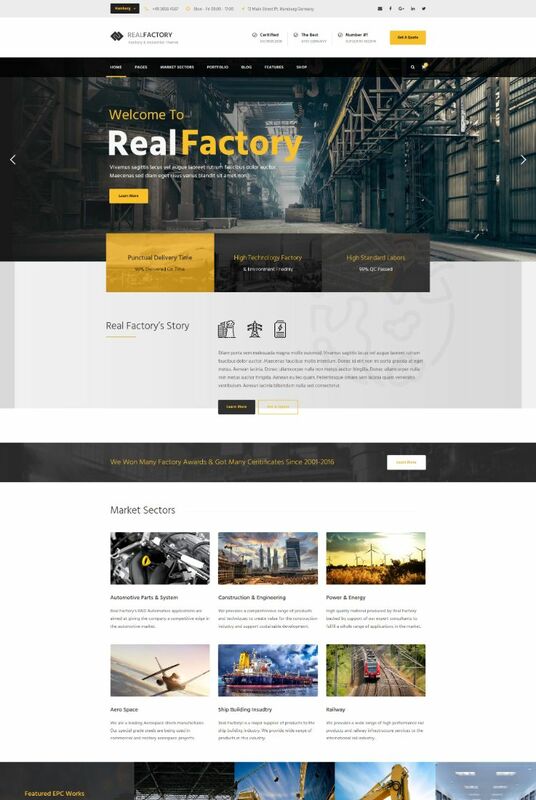 Real Factory is a construction WordPress template with a fully responsive design. This highly customizable theme has a powerful admin options panel which lets you customize almost any section of your website. With a live customizer, you can edit the theme as you like and preview the real changes. Real Factory WordPress theme has four homepage layout options. So, you can pick the one that best fits your business. The top of the homepage has a transparent and sticky menu which makes navigations pretty easy. A big slider welcomes visitors into your site from where direct visitors to your other significant pages. In the homepage, there are sections to show brief information about your business, your major services, your biggest projects, and the latest news related to the construction business. You can also post vacancies on your site. Likewise, with the testimonials section, show the reviews and compliments of your happy customers. The theme comes with a free Revolution Slider that lets you create sliders with drag-drop interface. Likewise, the theme fully supports WooCommerce plugins and WPML.org. 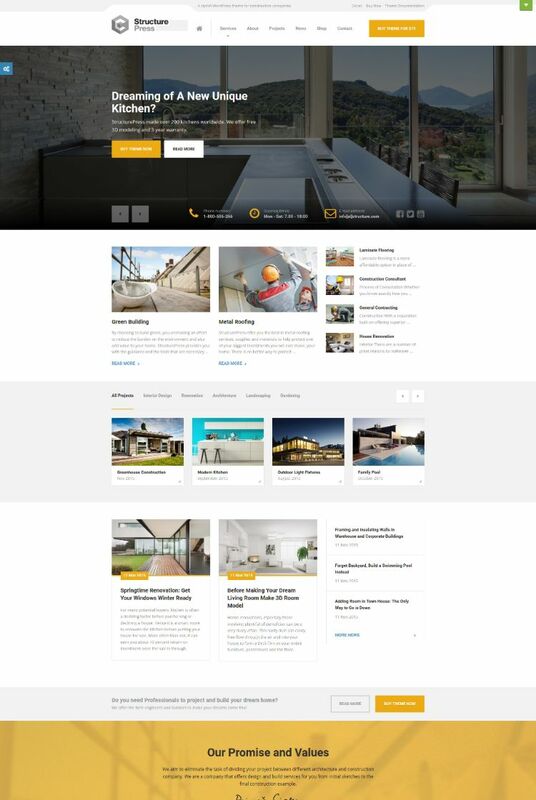 StructurePress is a construction WordPress theme which can be used to make websites of construction, architecture, renovation, and design businesses. It comes with an integrated Page Builder, so you can easily create your website without the use of any complex code. It has custom widgets for vacancy section, portfolio pages, and project sections, and more. A big image slider welcomes your visitors into your page. You can put posts of some other pages and direct your visitors to the pages that you like. On the homepage, you can display your major services, your projects, and also the latest news about the construction industry. The theme also has a testimonial section where you can post the words of your happy clients. With genuine and excellent reviews, there are chances that you may get a huge number of new potential customers. Moreover, you can integrate different social media accounts in this theme. So, if your business is active in any social media, you can link the page in the site. Besides, there are additional benefits you get with this theme. The theme is multilingual, has quality codes, and is retina ready. 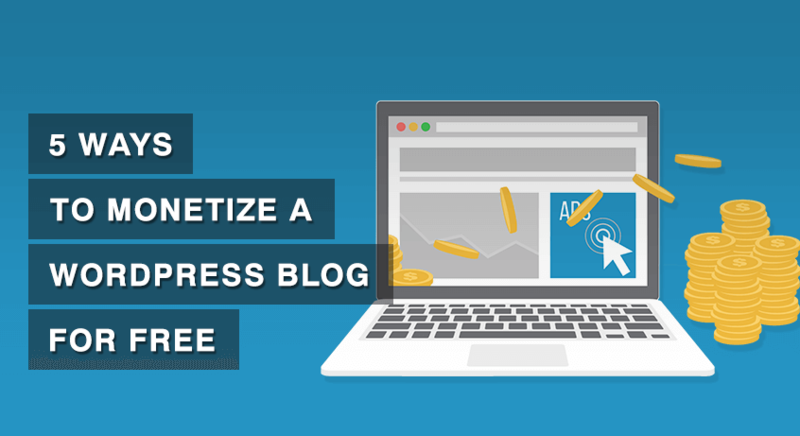 You also get access to many goodies including free PSDs if you buy StructurePress WordPress theme. SKT Construction WordPress theme is built to cater to the needs of construction businesses. 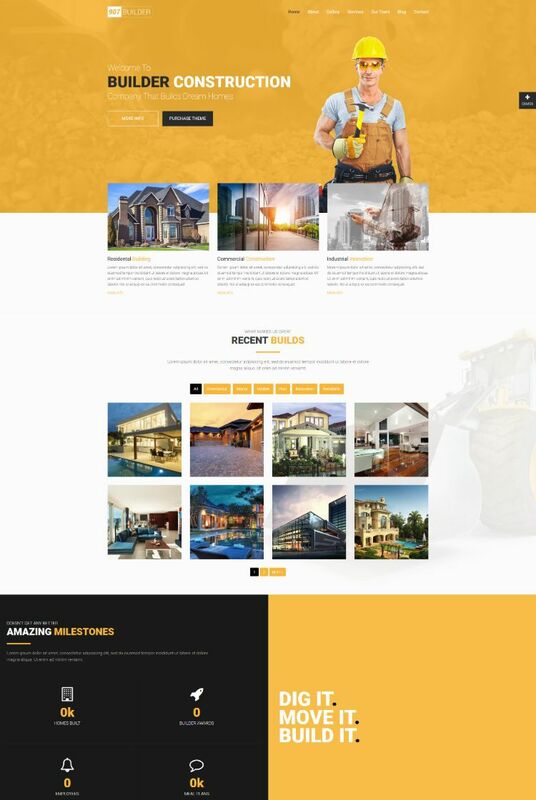 Construction companies that are interested to build their presence online can use this theme to create a fully functional and beautiful website. This responsive theme has passed the mobile-friendly test which means it looks great on all devices. Likewise, the theme is built with customizer API which allows you to see the changes that you make on your site instantly. SKT Construction is compatible with popular plugins like Nextgen Gallery, WooCommerce, and Contact Form 7. With lots of white space, your website will look clean in design. A huge image slider welcomes your visitors to your site. Right below the slider, you can post a few words about your company and services. With the Nextgen Gallery, you can show an attractive gallery of your previously completed projects. Right below the gallery, there is a strategically-placed contact section. So, you can lure those visitors to be your next clients. The theme also has a testimonial section where you will put the praising words of your previous clients. This helps to gain your visitors’ trust which are your potential customers. Besides, you can show the latest news and posts related to construction and also show the logos of your reliable partners. With all these features, you can easily make a construction site that stands out from the rest of them. Modernist differs from the themes that you usually see on the market place. This theme is simple but powerful. 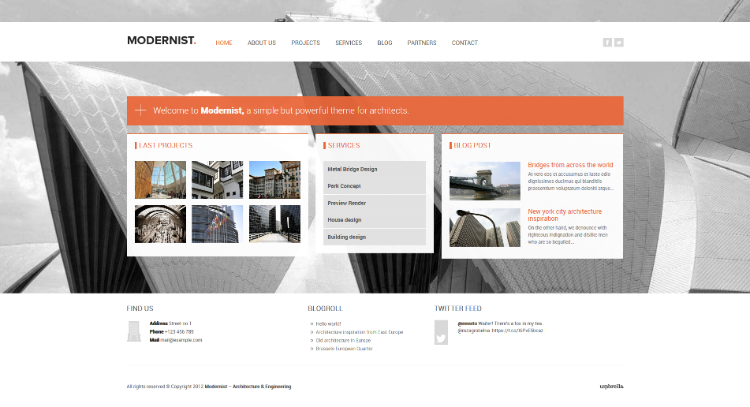 You can use Modernist to build websites of architecture and engineering companies theme. 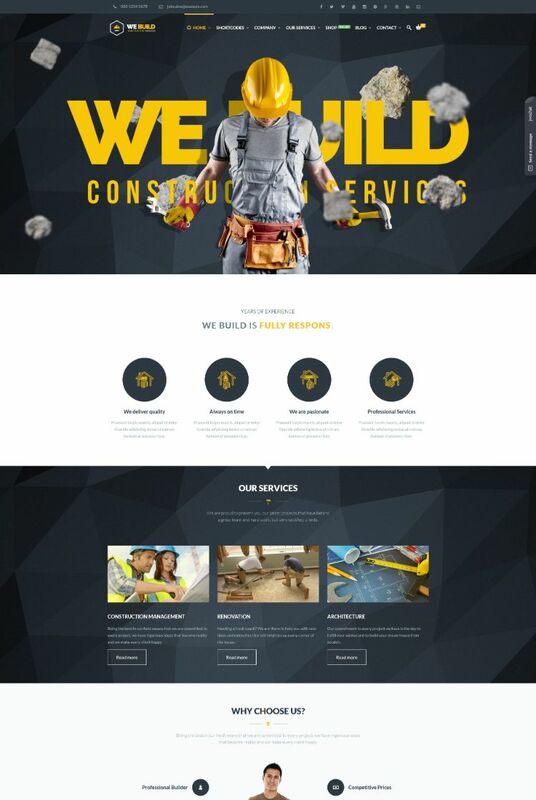 You can also use this theme to build websites of construction-related businesses. A surprising thing about this theme is it uses no plugins. Every element of this theme is internal. Unlike homepages of other themes, you merely have to scroll down. The theme has a huge slider image section overlapped with the menu on the top and the three sections that can direct your visitors to other pages of your site. You can show the latest projects, major services, and blog post. Below the banner lies a widgetized footer sections where you can put your contact information, social media buttons, and more. Besides the homepage, service page, project gallery page, and blog page, you have Partners page and contact page. Renovation is a fully responsive WordPress theme built specially for making home maintenance, repair, and renovation business websites. 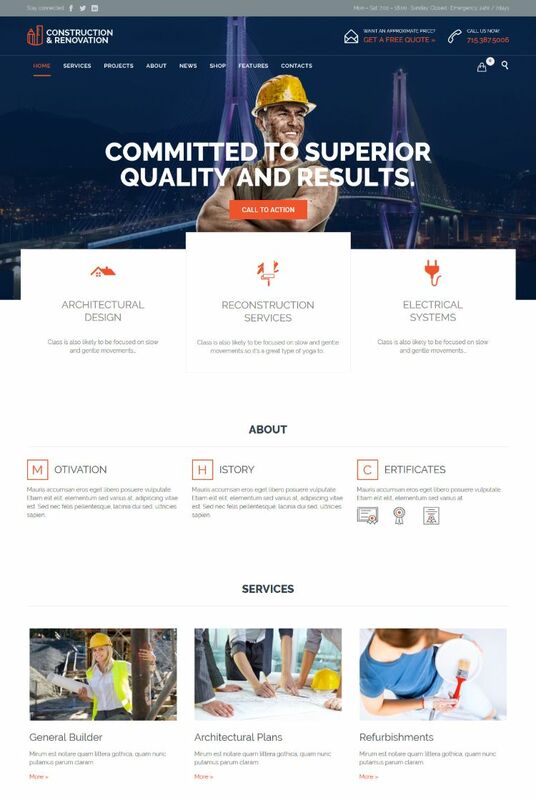 You can use this theme to make websites of businesses that provide electrical service. Plumbing, door and window repair service, roofing service, drywall repair, interior maintenance, and so forth. The theme has a well-built homepage layout with highly functional sections. There is a slider banner on the homepage where you can put attractive images and posts. Below the slider banner, provide information about your business and services. There is also a cost calculator that you can integrate with the theme. However, you need to pay for the cost calculator. Besides, the homepage has a beautiful testimonial section where you can show genuine statements of your clients. There is also a section on the homepage where you can post news, tips, and guides of your home renovation and maintenance services. Besides the homepage, the theme has other pages like Services page, Blog, shop page, contact page, and more. Renovation WordPress theme is WooCommerce compatible. It uses Visual Composer Builder which lets you create your pages with drag-drop editor. Besides, the theme also includes other popular plugins like Templatera, Slider Revolution, Essential Grid, MailChimp, Contact Form 7, and more. We Build is a premium construction WordPress theme that can be used to make websites of wide varieties of construction-related business. The theme helps you brighten up ideas and show your business to the world in an appealing way. With high customization options, you can fully control your site and give your site an attractive design. On the homepage, you have several attractive sections that you can use to show your services, latest projects, the total number of completed projects, team members, and price lists of your services. Likewise, you can show your company’s portfolio in various layouts like masonry, grid, classic, and columns layouts. Each style option is feasible with Ajax or Load More options. The theme is fully responsive and retina ready. It has parallax backgrounds which let you change the face of your site with a few images. The theme is quick with a short page load time. On top of that, the theme offers you an elegant website loader which shows the loading of your site in a stylish way. Besides, the CSS3 animations let you highlight your ideas with amazing animations. 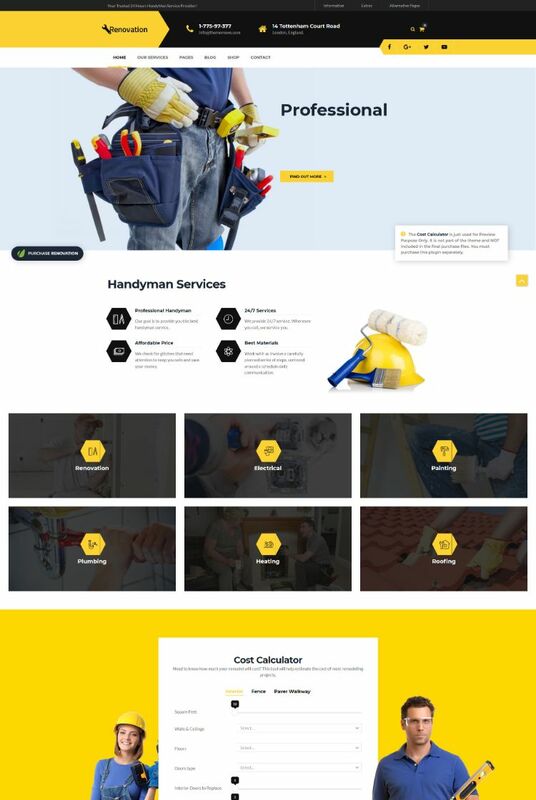 Blue Collar is the perfect WordPress theme for those who are planning to get a website for their home maintenance and renovation company. This theme has a fully responsive design and looks simple and easy to use. The theme comes with a child theme. 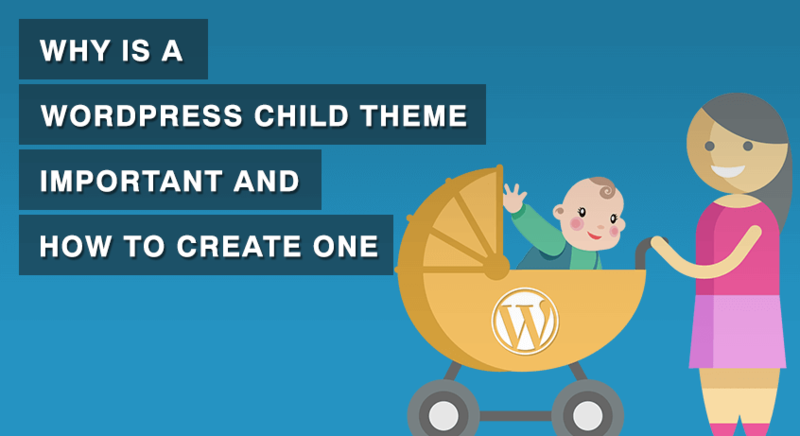 It is easily customizable by the child theme. On the homepage, you can show your company’s major services at the top. Below that, there is a section where you can talk about the distinct and unique features of your business. The theme got its update recently in February 2019. With the recent changes, a lot of new features and changes are added in the theme. Now, this theme has some new custom post types including Testimonials, Gallery, FAQs, and more. On the portfolio section, show off your projects in an elegant way. If you want to show your work without attaching them to any distinct projects, you can put those images on the Gallery section. Likewise, you can introduce your team members to your visitors through the People section. Furthermore, you can make your visitor coming back to your site with regular updates of new blogs in the Blog section. As charming as its name, Monolit is a beautifully designed WordPress theme with a clean and modern design. It is a great option for building websites of architects, designers, and builders. The theme comes with Visual Composer Drag and Drop Page Builder with advanced elements. You can build web pages with more extensive features easily. The theme is WooCommerce compatible and also has beautiful product images gallery. 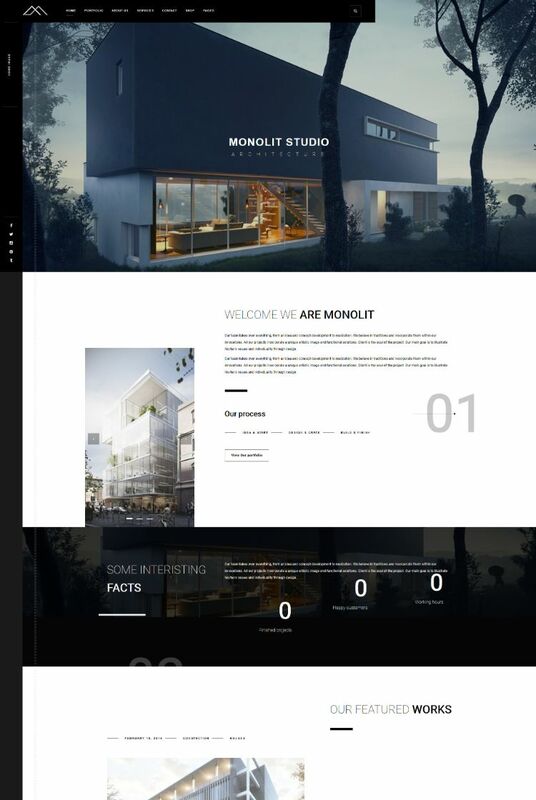 Monolit comes in both multi-page and one-page layout. You can put images or videos as the background and write brief information about your construction-related business below it. There is a statistic counter where you can show the number of finished projects, happy clients, and more. Furthermore, if you have completed projects that you feel special, you can exhibit them under your Featured Works. Apart from these, the theme also offers Team section where you can introduce your team members with your visitors. Some other sections on the theme include the Testimonial section, Partners section, and Location section. Re-Construction is a WordPress theme built for construction, plumbing, roofing, building, and home maintenance companies. The theme is fully responsive, easily customizable, and retina-ready. Re-Construction comes with Rapid Composer page Builder which lets you build pages quickly. Likewise, the theme options is powered by WordPress Customizer which lets you see the real-live changes you make on your site immediately. It has four demos from which you can choose the one that you think fits your business. You can welcome your visitors with a beautiful image slider on the homepage. You can also talk about your major services and show your projects on the homepage. The project section on the homepage lets you display your projects and categorize them in different divisions. Below it, you can display the words of your happy clients on the testimonial section. There is also a client section where you can list your clients. There are two sections above footers on the homepage which you can use to display the distinct characteristics of your company and blogs. These are 25 best construction WordPress themes to create construction and building websites. Hope this list helps you find a perfect theme for your website. If you have any queries or feedback, feel free to leave a comment below.